Jermaine Beal has absolutely shot the lights out at the Perth Arena for the Perth Wildcats to win by a massive 30 points in a dominant display that hands them the lead of the NBL over Melbourne United. Coming into the game, it promised to be one of the games of the year. first versus second on the ladder, with United needing to rediscover their form, and the Wildcats wanting to simply continue theirs. However, it became a one man show. Jermaine Beal shot 40 points, making 10 from three point land. By doing that, he becomes the first player to achieve the incredible feat since NBL introduced 40 minute games. Beal also is the first Wildcat to score 40+ points since Shawn Redhage did it in 2007. It wasn’t just the shooting though for Beal. While 40 points is a monstrous effort, he also teamed that up with seven assists and a couple of steals on the defensive end. Beal was strongly supported by the likes of Casey Prather and Matthew Knight who ended up with 14 and 11 points respectively. The Wildcats bench was also strong at various stages. Led by Tom Jervis, Shawn Redhage and Jesse Wagstaff they put the hammer down, ensuring Melbourne wouldn’t get back into the game. Those three players in particular were also apart of the Wildcats initial push. After a slow start to the game for both teams, with only a handful of points put up in the first few minutes it would be United who were the first team to pull away. Every time Melbourne looked threatening throughout the game, Daniel Kickert was at the centre of it. Their initial pull away to a maximum of an 11 point lead was led by him, Stephen Holt, Chris Goulding and Todd Blanchfield. By the middle of the first quarter, it was the Wildcats under all sorts of pressure. However, their bench was able to bring it back to just an six point lead at the quarter time break. From there, the Wildcats would quickly eradicate the deficit with Jermaine Beal starting to heat up. By the end of the second quarter, and when the players broke for half time the Wildcats were in front by 16. From there, United mounted various short lived come backs. Jermaine Beal slowly lost his incredible shooting mojo towards the back end of the second half, but it didn’t stop him assisting or Casey Prather taking over the offence of the Wildcats. Daniel Kickert and Hakim Warrick seemed to be at the start and end of every mini resurgence by United, but in the end it was just never going to be enough and Beal made sure of that in the first half with an exhibition of shooting. The Wildcats now have a stack of away games coming up, starting in Sydney on Sunday. United meanwhile, also take on the Kings in their next game next Wednesday. A top of the table clash that promises to be a classic will take place from the Perth Arena, as the in-form Perth Wildcats take on Melbourne United. Join The Roar for live scores and coverage from 9:15 pm (AEDT). 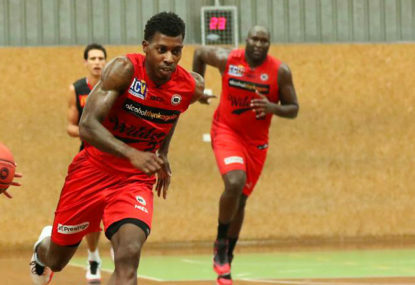 The Perth Wildcats have looked close to unstoppable in recent weeks. They sit with a ten win and five loss record, just one game back from United. A win here, though, would more than likely give them first place on the ladder, pending points percentage, with United having won 11 of their 15. Perth’s run in recent weeks has been on the back of some incredible play from Casey Prather. While he has been the stand out with his exceptional speed and footwork, the likes of Jermaine Beal, Matthew Knight and Nathan Jawai have all stood up at one point or another to keep the Wildcats moving forwards. In saying that about Prather, Damian Martin shapes as the key in such an important game. His experience and control should help to channel the efforts of players like Prather into key points of the game and their combination shapes as an incredibly important one. The Wildcats last start was an 18 point win, a massive turn around from their 21 point loss away from home to the New Zealand Breakers earlier in the week. Melbourne meanwhile, after winning their first nine games of the season have lost four of their last six, and it so nearly could have been five. Their last start was a three-point win over the Adelaide 36ers, although it was only one Jerome Randle shot from over time. Before that it was a demoralising loss to the Illawarra Hawks and a three-point win over the Townsville Crocodiles. The level of play Melbourne have recently displayed has been incredibly different to that they showed across their first nine games. They have been placing a far too heavy reliance on their three point shooting, and their dominance on the boards has been dissipating. These teams have met once this season, with United claiming a two-point victory back in round four. Prediction: United have looked vulnerable lately, and we can expect that Casey Prather, Damian Martin and Jermaine Beal will make full use of that, powering the Wildcats to the win at home. Join The Roar for live scores and coverage of what should be an epic clash from 9:15 pm (AEDT) and don’t forget to leave a comment if you’re following along with the action.